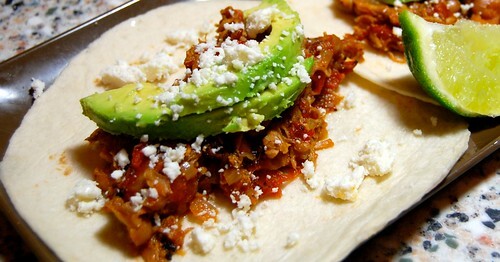 I first heard about Pork Tinga from Chef Rick Bayless and his recipe in Food & Wine Magazine’s February 2012 edition. I have his Mexican Everyday cookbook and absolutely love it, and Asheley and I both love pork (check out my Taccozzette con Stracotto and Pulled Pork recipes), so I decided to give it a whirl. 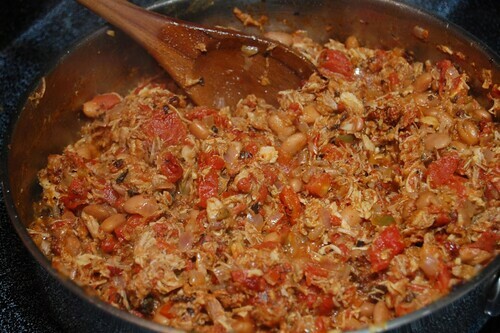 After some trial and error and then further research, I have come up with a recipe for Pork Tinga Tacos that is kind of a blend adaptation of Rick Bayless’s recipe along with that of America’s Test Kitchen. Tinga, a traditional Mexican dish, features braised shredded pork (alternatively, beef or chicken) that is simmered with onions, garlic, and spices, served up on a tostada. 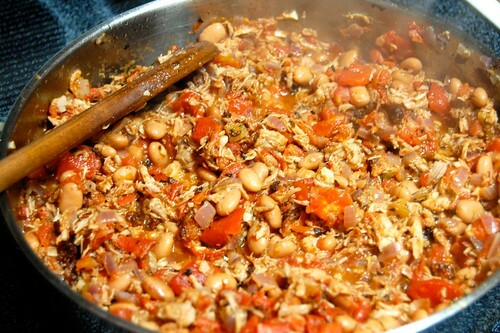 The complex smoky tomato flavor in traditional Pork Tinga is achieved here through the use of fire-roasted tomatoes and chipotle peppers in adobo sauce. Serve on warmed tortillas, topped with sliced avocado, crumbled queso fresco, and a squeeze of lime. 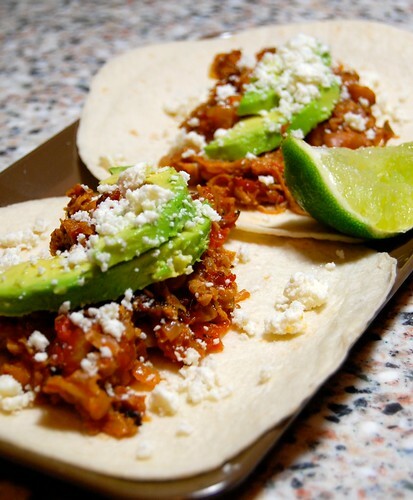 A deliciously hearty Winter taco recipe, Pork Tinga is a traditional Mexican dish featuring braised shredded pork. Comfort food at its finest! 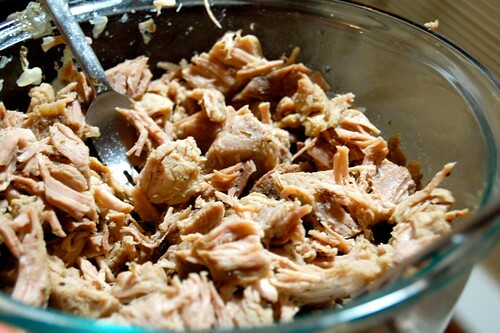 Prepare the pork: cut into approximately 1″ pieces, trimming as much visible fat as possible. In a large saucepan, add the pork, the one onion that has been roughly chopped, 2 smashed garlic cloves, marjoram, thyme, and bay leaves to 4 cups of salted water. Partially cover the pan and simmer on medium-low for about 60-70 minutes, until the meat is very tender (it should easily shred). Using a slotted spoon, transfer the pork to a bowl without getting too many of the onions or garlic (I actually use a fork and just lift the pork out that way). Let cool slightly, then shred it into smaller pieces with two forks. Skim the fat from the top of the “pork broth” and reserve about 1 1/2 cups, putting the broth through a strainer to remove the garlic/onions/bay leaves. In a medium, deep skillet, heat the oil over medium/medium low heat. Once hot, add the chorizo and stir, breaking up the sausage into smaller bits, until completely cooked through, about 10 minutes. 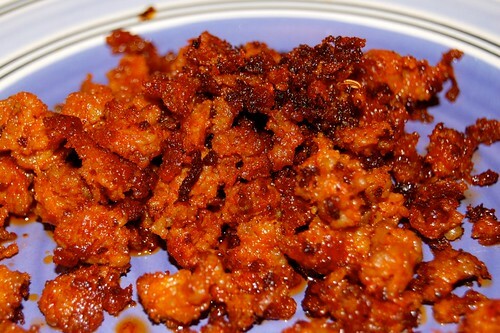 Using a slotted spoon, transfer cooked chorizo to a plate. 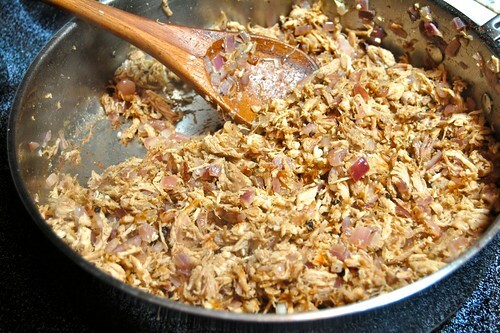 Add the shredded pork and the other onion that has been finely chopped to the skillet and cook over medium heat until the pork is well-browned and the exterior develops a bit of crispy texture, about 10 minutes, stirring occasionally. 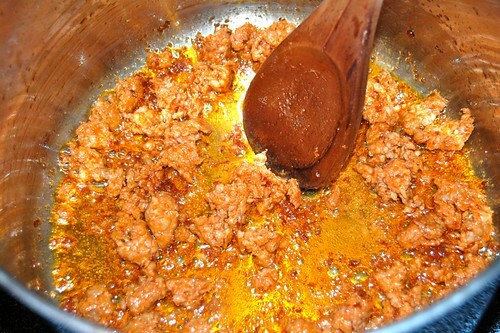 Add the 2 minced garlic cloves and cook for 1 minute, stirring. 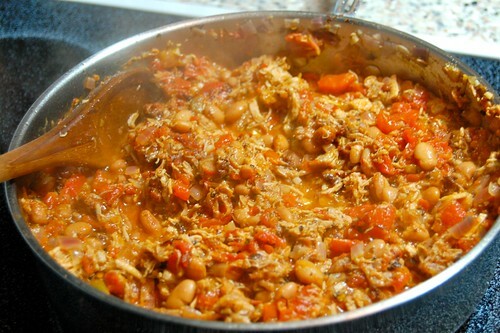 Stir in the tomatoes, beans, and cooked chorizo and cook for 10 minutes. Season with salt as needed and a pinch of sugar. Add the chipotle chile(s) and 1 1/2 cups of the pork broth; simmer for about 20 minutes, until mostly all the broth has been absorbed/cooked off, stirring occasionally. Scoop the finished pork tinga onto warmed tortillas, and top with crumbled queso fresco, sliced avocado, and a squirt of fresh lime juice.